Paddleboard Exercise Routines for Shredded Abs- Pro Tips! If you hit the beach or river often, then you’ve probably seen plenty of people on SUPs and watched as they performed killer paddleboard exercise routines that are designed to burn two to five hundred calories in as little as forty-five minutes. If you enjoy paddleboarding, then it’s time to take it to the next level. Just paddling around will still burn calories, but a workout designed for SUPing will have you seeing results in no time. Try your workout on one of the best SUPs from our list! A SUP workout routine can include crunches, squats, and even push-ups, which offers a total body workout designed for faster results. These workouts are designed to fire more muscles, which results in speedier sculpting and a fun way to earn toned legs, arms, and killer abs. For this workout, you’ll need a board, paddle and a good spot such as a lake or large pond. You’ll need to do each of these moves until you can’t complete another rep with good form. Beginners should aim for twenty or more, while people already physically fit should strive for thirty or more. Each time you do this routine, try for more reps. Begin in a deep squat with your feet placed hip-width apart, elbows touching the knees, thighs parallel with the board, and with the paddle placed at chest level. Now, rise up on your toes and you lift the paddle up. Repeat for as many reps as possible. Lie on the board face up, with your legs placed straight out and hold the paddle with hands placed at the hips. Now, engage your abs, crunching up to a sitting position with your knees bent. Rotate your torso at the same time. Repeat this movement on the opposite side. Try for a minimum of twenty to thirty reps, with a total of three sets. Lie on your left side with your legs stacked, knees bent. Your right palm should be placed on the board in front of your chest with your left hand on your right shoulder. Push your right hand into the board and raise your torso as high as you can. Lower to start and repeat on the opposite side. Begin standing with your feet placed sideways and wide. Put the paddle in front of you with your right hand gripping the top and the left hand about two feet down. The paddle should be slightly dipped in the water with the blade placed perpendicular to your body. Now, quickly rotate your torso to the left until you feel the abs engage. Now, move to the right to work the other side. Begin lying face up on the board, raising your legs straight up from the hips, your hands should be each side of the board near your head. Lift your hips and rotate the left hip toward your right shoulder. Lower to the starting position slowly and repeat on the opposite side. 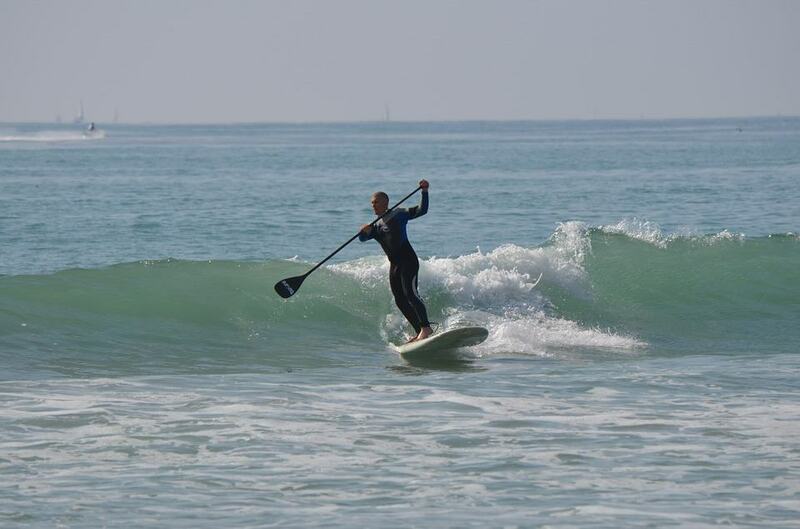 Move into the water on one side of the SUP, placing your hands shoulder-width apart near the middle of the board. Now, push down until your arms are straight in order to lift your body out of the water. Move back to the starting position and repeat for three sets of twenty to thirty reps. Begin by standing on the board and placing your feet hip-width apart. Hold the paddle with your hands wider than shoulder-width apart, with your palms facing in. Now, press the paddle overhead and attempt to pull it apart as you continue to hold it at the top. Sit on your SUP with your legs extended and your knees bent slightly while holding the paddle on your left side with the blade in the water. Now, place your right hand about a foot from the top of the shaft and your left hand about two feet down the shaft and extend your arms. Begin dragging the paddle through the water, pulling until both elbows are at a ninety-degree angle. Switch sides and repeat. Start off lying face down on the SUP with your arms extended. Next, raise your arms, chest, and feet as high as you can, while bringing the shoulder blades together and start to pull your elbows to create a ninety-degree angle. Hold for five to ten seconds and return to the start. If you’re a beginner, it’s important to choose your workout location wisely. Even a seemingly peaceful river or the ocean can have unexpected currents that will make you pretty unstable on your board. So, what’s your best bet? Try working out on a bay or calm lake, working up to choppier water as your fitness level improves. Most surf shops rent out SUPs. Keep an eye out for a lighter, wider board that’s designed for exercise and cruising instead of a narrow or longer board. Choose a paddle that has a shaft that’s about as tall as your shoulders. We’re not kidding when we say that a SUP is pretty stable. But some models can be pretty hard to tuck under your arm. For easier transport, look for a board that’s equipped with a side handle. Learning how to carry your board on your head can also come in handy. To do, stand the SUP on its nose, hold the sides of the board and bend over in order to center it against your head. Now, you should be able to lift the board so that it’s balanced perfectly on top of your head. 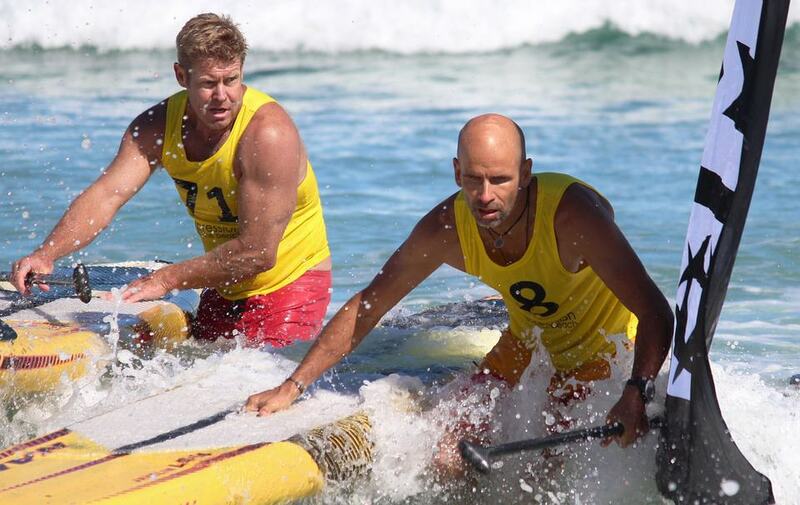 Are you clueless when it comes to how to hold the paddle? If you’re paddling on your left side, your right hand should be on top as your left-hand grasps the paddle near the hips. 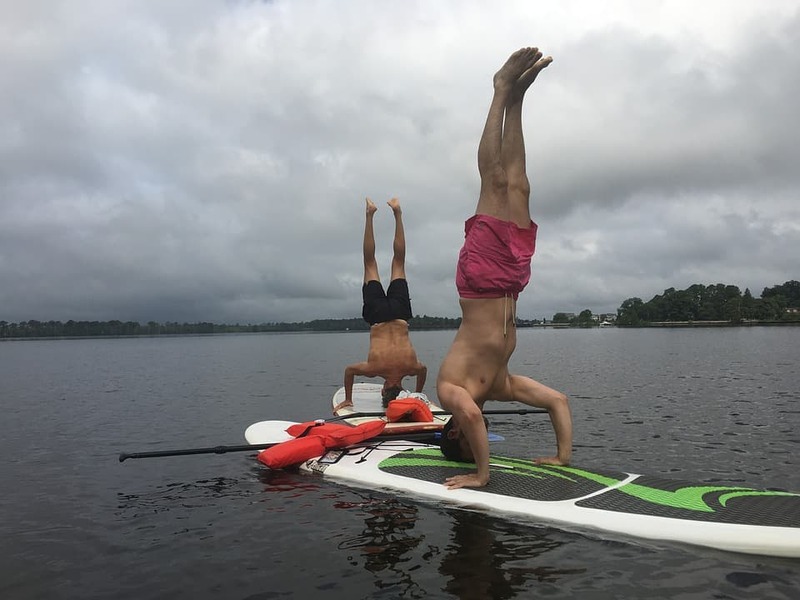 In order to go straight you don’t have to switch sides, instead, simply draw an upside down capital L. You can do this by placing the paddle in the water two feet away from the board at the nose and pull toward the board, then along the side of the board. Paddleboard Exercise Routines for Shredded Abs	Overall rating:	5	out of 5 based on 5	reviews.